The first CCRA was published by the Department for Environment, Food and Rural Affairs (Defra) in 2012. For this second CCRA due by January 2017, Defra asked the Adaptation Sub-Committee of the Committee on Climate Change (ASC) to prepare an independent Evidence Report setting out the latest evidence on the risks and opportunities to the UK from climate change. This Evidence Report will feed in to the development of the next UK National Adaptation Programme, expected in 2018, as well as the national adaptation programmes of the devolved administrations. Step 1: Understand present-day vulnerability and assess current climate-related risks, opportunities and levels of adaptation. Step 2: Understand future vulnerability and adaptation, and assess how climate and socio-economic change may alter climate-related risks and opportunities in the 2020s, 2050s and 2080s. Step 3: Prioritise risks and opportunities for which additional action is needed in the next five years to manage the risk or take advantage of the opportunity. The Evidence Report uses the concept of urgency to summarise the findings of the analysis. One of four ‘urgency categories’ has been assigned by the ASC to each risk and opportunity: more action needed, research priority, sustain current action, or watching brief. 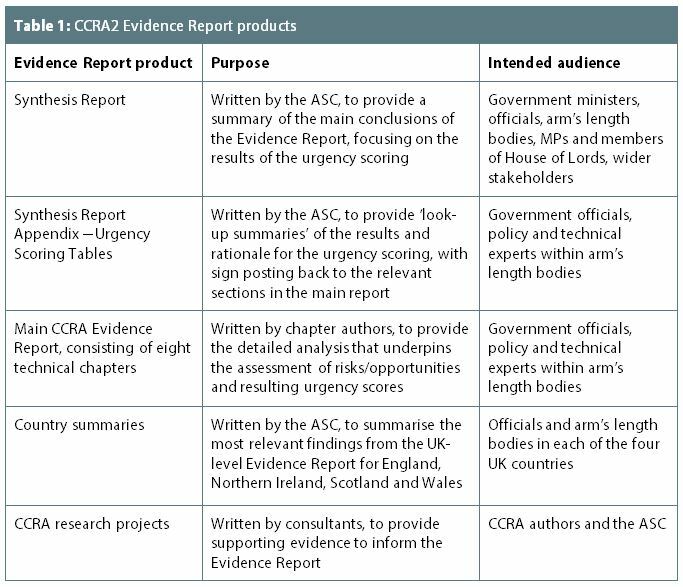 Details of the urgency scoring can be found in the Synthesis Report Appendix and in Chapter 2: Approach and context. In total, the CCRA Evidence report consists of over 2,000 pages of analysis and has used over 2,000 different sources of evidence. The ASC and authors dealt with more than 6,000 review comments, and summarised the outputs of the CCRA into six key findings. The project took three years to complete. The CCRA is presented through a number of different products shown in Table 1.